For me, the holiday season is a time of joy and wonder -- when I count my blessings for all the goodness in my life. Colorful decorations and lights, festive music, time spent with my loved ones...and lots of great food. Unfortunately, this is not the case for everyone. Many American families are going hungry, or are food insecure, this holiday season -- so they struggle to have enough food to eat. I wanted to do my part to help! Enter Feeding America and the New York Beef Council via the #Foodies4Foodbanks holiday fundraising effort. Via Feeding America's nationwide network of food banks, there's a way to help feed those in need this holiday season -- which is where you come in!! The Weekend Gourmet is joining other food blogs to encourage our readers to donate to #Foodies4Foodbanks between now and December 12th. As part of this event, we're also sharing some of our favorite economical beef recipes. I wanted to make a streamlined version of shepherd's pie that can be whipped up on the busiest of holiday weeknights. My Streamlined Weeknight Shepherd's Pie tastes like it's been cooking for hours, but it's ready in about 45 minutes -- most of which is hands-off time! I used economical instant mashed potatoes here, which keeps the price of this comforting family meal right at my goal of $10 total to feed four people. Since shepherd's pie reminds me a bit of a pot pie, I cooked my shepherd's pies in four individual ramekins. However, you can layer everything in one 2-quart casserole dish instead. Step 1: Add the oil to a large non-stick skillet on med-high heat. 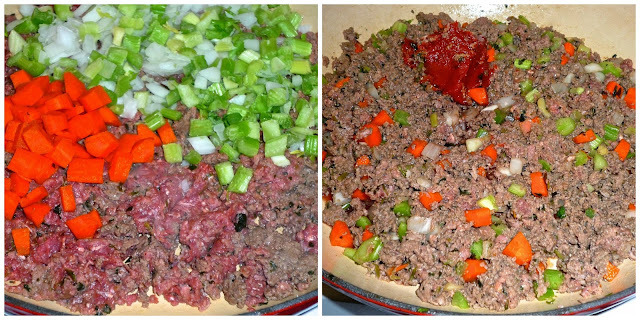 Add the ground beef, garlic, parsley, and salt & pepper. Cook, breaking up the meat, until it begins to brown. Add the carrots, celery, and onion. Cook, stirring often, until the meat is browned and the veggies begin to soften -- about 5 minutes. Add the Worcestershire and 1/2 cup of the beef broth. Reduce heat to medium and stir until the tomato paste evenly coats the meat and veggies. Step 2: Add the corn and mushrooms to the meat mixture and stir well to combine. Sprinkle the flour on top of the mixture and stir well to evenly incorporate. Cook for 1-2 minutes. Add the remaining 1.5 cups of beef broth and stir well to completely combine all ingredients. Bring the mixture to a boil, then reduce heat to med-low. Cover and simmer for 20 minutes. Remove lid and cook for 5 additional minutes, allowing the mixture to thicken and reduce. Step 3: Preheat oven to 375. Evenly divide the beef and veggie filling between four 2-cup ramekins. Top each ramekin with 1/4 cup grated cheddar cheese. Spoon 1/2 cup mashed potatoes over the cheddar on each ramekin, using a spoon to spread the potatoes evenly on top. Use the tines of a fork to place crosshatches down, then across on the top of the potatoes -- which allows for nooks and crannies that crisp and brown. Sprinkle the top of each ramekin with Creole seasoning and parsley. If you don't have creole seasoning on hand, just use a bit of smoked paprika. Step 4: Place the ramekins on a rimmed baking sheet. Bake for 10-15 minutes, until the potatoes are golden and crispy on top. Carefully place each pie on a plate and let cool about 5 minutes before serving. Be careful when eating, as the filling can remain very hot for several minutes! This dish is a complete meal, but a crisp green salad makes a nice pairing. Sigh...this dish is like a comforting hug on a chilly day! The beef and vegetable mixture has complex flavors thanks to the broth, tomato paste, and Worcestershire used in the sauce. The mashed potatoes are creamy, with crispy bits on top, and the surprise layer of melted cheddar that ties it all together. If you would like to donate to the #Foodies4Foodbanks holiday fundraiser, I would be very appreciative! Any amount you can donate will help feed hungry families all across the country -- and I promise it will really put you in the holiday spirit of giving!! To donate, simply visit The Weekend Gourmet's donation page, where you'll find the simple donation instructions. Thank you for helping me help feed hungry families -- together, we can do so much to make their holiday season a bit happier! !